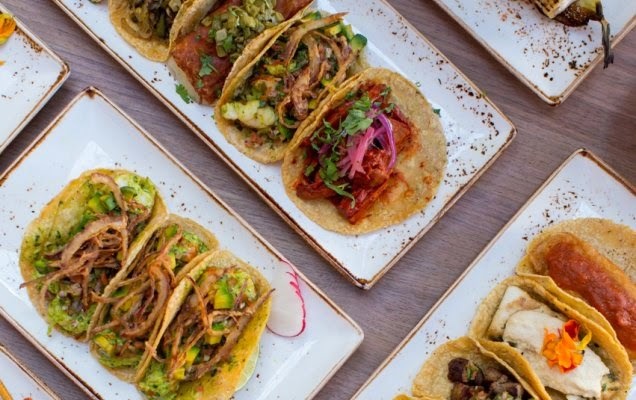 Puesto is set to open the expanded version of their popular taco haven in an adjoining space to the original La Jolla Puesto. Taking elements from their second location at The Headquarters, which opened in November to a new proliferation of fans, La Jolla’s Puesto will open the doors to their new space on June 12. Known as a favorite spot for quick-service tacos featuring Puesto’s signature crispy melted cheese and house-made tortillas, the La Jolla Puesto will now echo the look and feel of the Headquarters location with stunning design, a lively atmosphere and a wider selection of modern Mexican fare. The original La Jolla space will operate the more casual taco line from 11am to 4pm and will be seated as part of the full-service dining from 5-10pm. The new adjoining 1,000 square feet, complete with bar seating for 10, will operate from 11am-10pm entirely as a sit-down dining experience. La Jolla’s full-service menu will feature the antojitos or Mexican snacks such as the mahi mahi ceviche Acapulco and house-made crab guacamole, along with additional tacos like the lobster and filet mignon that have become favorites at Puesto’s downtown location. The Platos Fuertes, including Puesto’s moles and short rib barbacoa will also be available to provide La Jolla with Chef Luisteen Gonzales’ rich authentic Mexican flavors. Puesto La Jolla will also offer brunch every Sunday from 11am-3pm beginning right away. The owners of Puesto again looked to famed designer Thomas Schoos, to create a space that reflects the energy and vibe of Puesto’s food. Incorporating similar furnishings, details and fixtures from Puesto at The Headquarters, the La Jolla space also features a sidewalk patio for dining al fresco. Several of the original architectural elements have been left raw, including a 15-foot ceiling that is anchored with large industrial skylights to provide an open-air feeling. Graffiti artist Chor Boogie transformed the walls into brightly color murals with his signature style. The original La Jolla space has been refreshed to compliment the additional square footage, making one cohesive restaurant. The much talked-about downtown bar program created by Jen Queen, Lucien Conner and Ian Ward will be served in the La Jolla restaurant, along with six wines on tap, including varietals from the Guadalupe Valley and many of San Diego’s best craft beers. Lucien Conner will also be the General Manager bringing his wealth of hospitality to La Jolla. Puesto is family-owned and operated by brothers, Eric and Alan Adler, and their cousin Isi Lombrozo, all native San Diegans and La Jolla High School alums. A native of Mexico City, Puesto’s Executive Chef and Partner Luisteen Gonzalez brings genuine Mexican flavors and over a decade of experience catering exquisite Mexican food. Puesto La Jolla is located at 1026 Wall Street, La Jolla, California 92037 in downtown La Jolla. Puesto is open daily from 11am to 10pm. Puesto at The Headquarters is located at 789 West Harbor Dr. San Diego, California 92101. Puesto is open daily from 11am to 10pm. For more information please visit eatpuesto.com and connect with Puesto at facebook.com/eatpuesto, twitter.com/eatpuesto and on Instagram @EatPuesto.